Another week is upon us already - time sure flies. Here we are in May already, nearly a week! which was so nice for many around here! and of course it was perfect weather for Derby Day festivities! but not all blues are bad! 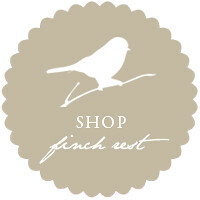 in my shop called Finch Rest Emporium. but don't have any blue decor at the nest. I know to grab it fast! I admire & respect the colour saavy lovers out there! You have such charisma and flair! I have about a million (or so it seems) things to list in the shop. It just takes time I haven't seem to have had lately! So please keep checking back for new things to appear! 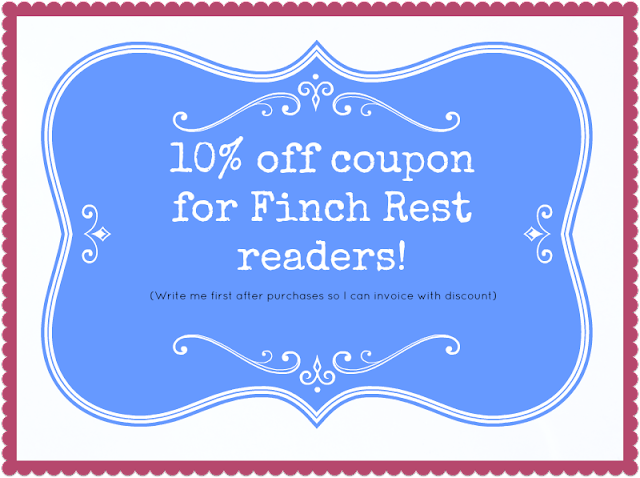 Use discount code FRE050613 when corresponding about discount. CLICK IMAGE BELOW TO GO TO SHOP! Blue is my favourite colour, so I'm not surprised that it sells quickly! You've shown some lovely things. Beautiful blue mosaic! So many pretty treasures. Going to go browse your shop! Gorgeous blue colors here! I have always been a pink and green lover, but in the past year I have really been smitten with all shades of blue. Of course everything on here looks so pretty because of the way you compose and photograph it! I'm so sorry that you had a problem with your link and that it took me until now to realize it! It's all fixed now, though, so you can have a Happy Blue Monday! PS When you begin to type in your link, helpful computers finish it for you, oftentimes adding an old link. That was your problem today! Beautiful blues Michelle and I love the chicken. What a lovely collection of blues Michele. I have always loved the crispness of blue and white, especially in nautical things. Also enjoyed your poem from Sunday - very sweet and true. You have excellent taste in blue things even if you don't personally have any blue in your decor. I have way too much in mine and always decided for me. Perhaps one day I'll change it around. Loved your nice list of suggestions for me today! 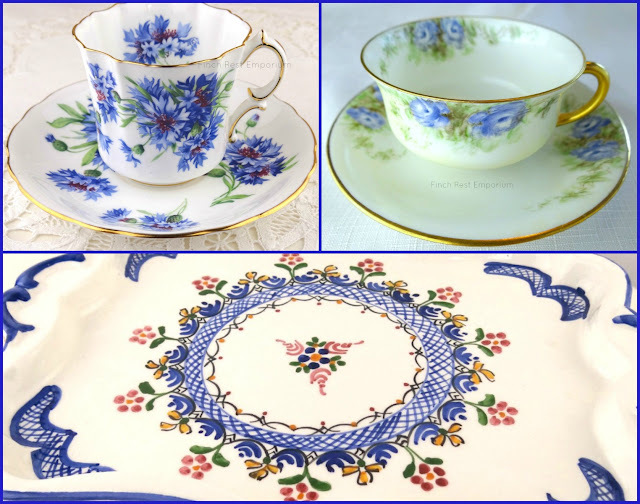 ohhhh that blue bachelor button tea cup is beautiful.....I love to look at blue things but have never used much of it in my house. don't know why..
Beautiful blue things to share! Have a great Blue Monday. I'm heading to your shop now! Very nice shop. 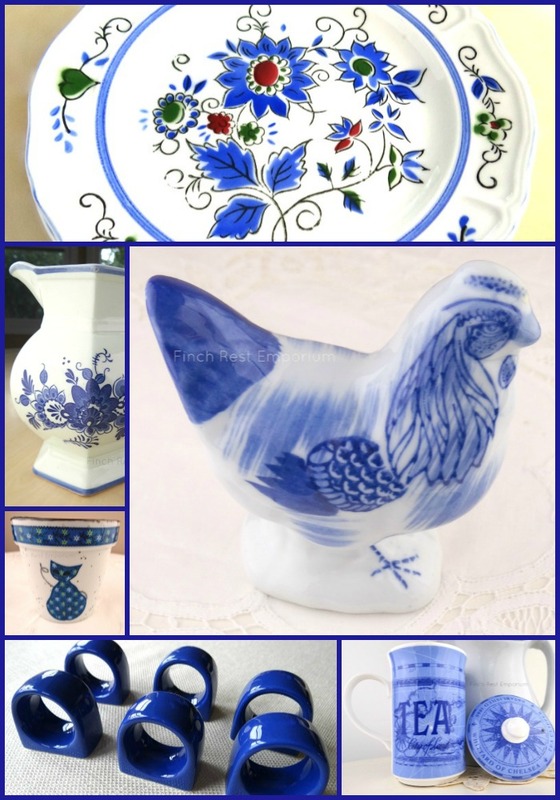 I love blue too but no longer have blue in my kitchen..still miss it and have kept my dishes and other items...silly huh? Michele, your blues are making me sing the blues. They are so lovely. I am hopping over to visit your shop. I can't wait till my basement is finished so I can see just exactly what I have. lol! Gorgeous blue collection Michelle! Your shop is fabulous, I'd love to go there and check all those lovelies you have! Have a blessed Mom's Day.